Show Masterpiece Project Easily show your masterpiece projects when hamburger menu (side menu) is opened. Black & White Pictures Make your black & white pictures in your gallery and change to color one when mouse over with ease in customizer. Featured Image in Background Easily set featured image in background via checking page template and browsing featured image. Photo Metadata Easily show the photo metadata including Camera Model, Focal Length, Aperture, ISO, and Shutter Speed. Infinite Scroll supports for galleries & portfolios For customers who would like to display a large number of galleries or portfolios, we created a simple solution for you. Now, you can display you gallery & portfolio in columns. Once your visitors scroll down to the end of page. It will automatically load new gallery or portfolio items. 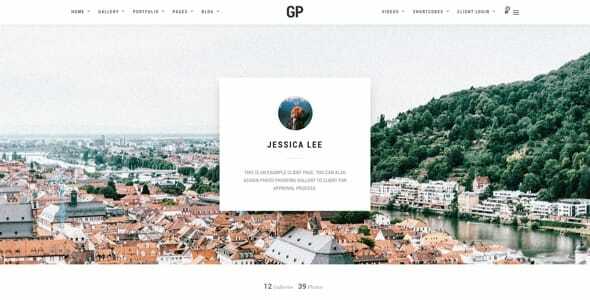 Fully Customizable With our flexible framework, this theme is the powerful theme to display awesome and various portfolios and photographs options; for example, full screen image and slide show etc. Not surprisingly, no two versions of theme will ever look the same. Easily set different typography of Main Content Font Family, Main Content Font Size, H1-H6 Font Family, H1-H6 Font Weight, H1-H6 Font Spacing, and H1-H6 Font Size. Simply change Side Menu Font Family, Side Menu Font Size, Side Menu Font Weight, Side Menu Font Spacing, Side Menu Text Transform (None, Uppercase, Lowercase, and Capitalize). Besides, simply set varying background of Menu Background Color. Moreover, effortlessly set Page Header Background Color, and Footer Background Color. Easily set different colors of Input and Textarea Background Color, Input and Textarea Font Color, Input and Textarea Border Color, Input and Textarea Focus State Color, Button Background Color, Button Font Color, and Button Border Color. Also, easily change Side Menu Background Color, Side Menu Font Color, and Side Menu Hover State Font Color. Special Pages Easily select file to be page background image for 404 not found page. Menu LayoutVarious options to choose your menu layout; for instance, Left Align, Center Align, Center Logo + 2 Menus, Hamburger Menu + Side Menu, Hamburger Menu + Fullscreen Menu, and Left Vertical. Sticky Menu & Smart Sticky Menu Only one click is required to display main menu fixed when scrolling and to make menu displays when scroll down and hide when scroll up. Moreover, Light & Dark Sticky Menu Color Scheme is available to match your style in your web site. Simply change Menu Background, Menu Font Color, Menu Hover State Font Color, Menu Active State Font Color, and Menu Bar Border Color. Contact Info Contact Hours and Contact Phone Number can be set. Moreover, only one click is required for opening Top Bar Social Icons link in new window. Only one click is required to enable Side Menu on Desktop, to display search form in header of side menu, to display search result instantly while typing, and to display galleries when side menu is opened. Also, effortlessly change Side Menu Font Family, Side Menu Font Size, Side Menu Font Weight, Side Menu Font Text Transform (None, Uppercase, Lowercase, Capitalize), and Side Menu Font Spacing. Effortlessly filter galleries by selected gallery category when side menu is opened and also select number of galleries displayed when side menu is opened. Effortlessly change Page Title Background Image Height in percentage. 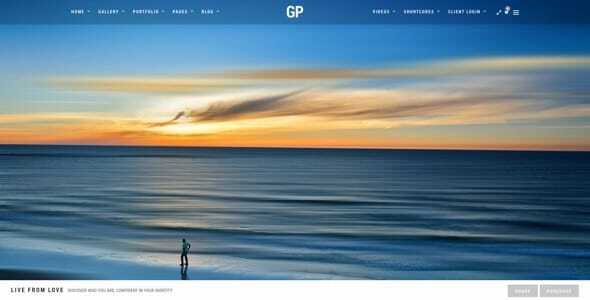 Only one click is required to enable add Parallax Effect to header background image when scrolling pass it. Easily change Page Header Background Color by color picker. Easily change Content Builder Header Font Size and Content Builder Header Text Transform (None, Uppercase, Lowercase, Capitalize). Easily change Page Tagline Font Color by color picker. In addition, easily change Page Title Font Size, Page Tagline Font Weight, Page Tagline Font Spacing and Page Tagline Text Transform (None, Uppercase, Lowercase, Capitalize). Only one click is required to display sidebar fixed when scrolling. Easily change Widget Title Font Family, Widget Title Font Size, Widget Title Font Weight, Widget Title Font Spacing and Widget Title Text Transform (None, Uppercase, Lowercase, Capitalize). Sharing Buttons Only one click is required to display sharing buttons on single gallery page content. Gallery images in columns layout black & white Only one click is required to make gallery images in columns layout black & white and change to color one when mouse over. Next and previous galleries Only one click is required to display next and previous galleries on Single Gallery Page Content. Notify Photographer Only one click is required to enable email notification option in photo proofing page. Effortlessly change the gallery board background by color picker. Only one click is required to display image caption under the image in lightbox mode and to display image lightbox in horizontal gallery template. Autoplay Slideshow Only one click is required to enable fullscreen slideshow when starts playing automatically. Random Slideshow Only one click is required to enable fullscreen slideshow the display image randomly. Display Image Proportion Size Only one click is required to enable the display of slide image proportion size without covering screen. Display Slideshow Arrows Only one click is required to enable the display slide navigation arrows. Display Photo Information Bar Only one click is required to display photo information bar for fullscreen slideshow. Slideshow Timer Easily adjust the number of seconds for fullscreen slideshow timer. Slideshow Transition Timer the number of milliseconds for transition between each image. Slideshow Transition Effect Effortlessly select transition type for contents in fullscreen slideshow. Kenburns Transition Timer Easily change the number of seconds for transition between each image. Only one click is required to make menu transparent for kenburns slideshow. Only one click is required to enable the displaymirror reflection effect in flow gallery and linking flow gallery to full size image in lightbox mode. Easily select number of photos displaying initially for 1-5 column(s) layout gallery pages. 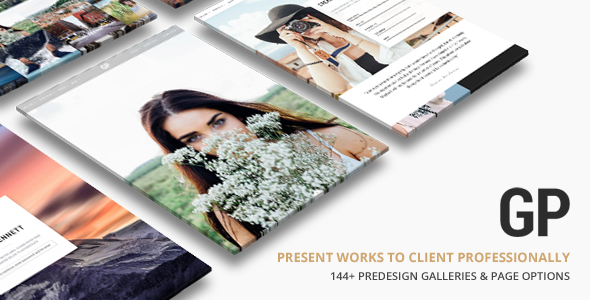 Effortlessly change the number of photos displaying initially for justified layout gallery pages. Only one click is required to enable infinite scroll for gallery pages. Only one click is required to enable filterable feature in portfolio page and also linking filterable to its page. Easily adjust the sorting of Portfolio Filterable Options by name, slug, ID, Number of Portfolio. Only one click is required to enable infinite scroll for portfolio pages. Only one click is required to enable the display next and previous portfolios in single portfolio page and the display recent portfolios in single portfolio page. Easily adjust the number of portfolios displaying in recent portfolios section and also enter your portfolio page URL so it displays portfolio page link in recent portfolio module. Only one click is required to enable the display post full content in blog page (excerpt blog grid layout). Easily enter title for this promo box’s title, URL for this promo box’s link for promo link 1-4. Effortlessly select image for this promo box’s background for promo link 1-4. Set layout of the single post page including Fullwidth, with left sidebar, and with right sidebar. 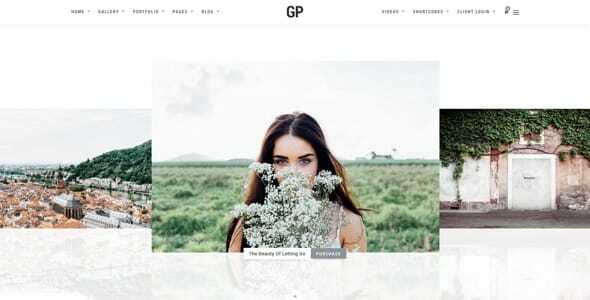 Awesome Gallery Options Theme comes with multiple gallery templates layouts for different purposes. You can choose to display full screen slideshow, parallax, flow, masonry, metro and classic gallery columns or even mixes between various gallery layouts. Specify the gallery template for the gallery. Upload zip file of your gallery images and this can be downloaded by visitors. Specify content type for the project including Youtube Video, Viemo Video, Image, Self-hosted Video, and External Link. Disable the featured image as header by only one click. Specify Youtube or Vimeo Video ID in case you selected Youtube or Vimeo Video. Specify Portfolio Categories for each portfolio. Manage and maintain Portfolio Category (Group of Portfolio) easily. All 6 Page layouts can have left or right sidebar or be full width. 3 post types are available including image, gallery, Youtube Video, and Viemo Video. Event Create event in your website easily. Just specify Event Date, Begin Time, End Time and Event Location, Event Categories and Parent Event Category. Add Get Direction on Google Map for customer to go the Event Location easily. URL where visitor can buy ticket for this event can be specified also. Manage and maintain Event Category (Group of Event) with ease. Team Member To show your team member, this theme supports lots of social profile information such as Position and Role, Facebook URL, Twitter URL, Google+ URL and Linkedin URL. Pricing Easily show your package/pricing options in your website. Just enable this pricing featured by only one click. Then, specify currency, exact price, price per time, pricing plan features, pricing button text and also button URL. Manage and maintain Pricing Category (Group of Pricing) easily.